Utilize the convenient corner space of your living room with this casual TV console. Finished in a deep espresso color, this console features double window pane glass doors and shelving within. Open shelves are available on both sides for additional storage options. 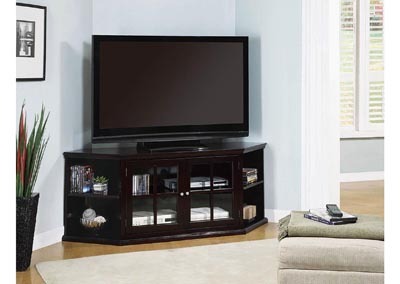 This sturdy console will support TVs up to 70 inches and 200 pounds.